Added discreet content types to internal x-posting options. Default to all content types. A change was made to the way links within top are displayed when there is no description text. Added the ability to display Instagram videos inline. Fixed an issue where nearly square images were being cropped incorrectly for profile images and room icons. Added display of vid.me videos within posts. Added system notification when a user is automatically moved to an overflow room. Implemented a new system for x-posting of content. Manual x-posting has been added to all content, allowing a user to x-post that content to another room. Automatic x-posting has been added allowing room administrators to set up content triggers to automatically x-post content from other rooms and hallways based on different criteria. Added logic to determine if URL is allowed to be opened in a frame. If allowed, the new content modal is used. If not, the URL will open in a new tab/window. We’re pleased to announce that Bitverse will be open to the public beginning at 10:00 a.m. ET, September 13, 2015. For many months, we’ve imagined what the evolution of live chat could be and should become. Somewhere between forums, subreddits, open and closed social media, there’s a special combination of dynamic features and modes that create a great live experience. We’re setting out today to make that experience a reality. 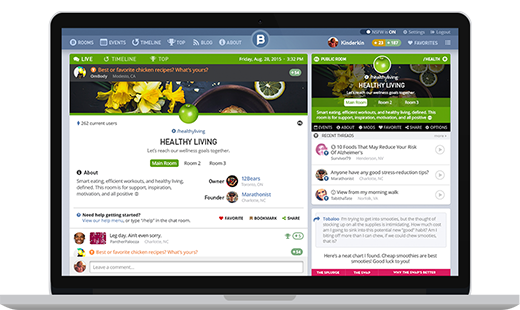 You’ll notice that a few rooms have already been established, as we want to make sure the right people – those who successfully run and moderate existing websites, message boards, subreddits or forums around a specific subject matter – get an opportunity to manage major communities in Bitverse. To apply for ownership of these rooms, just click on the application link in the room’s placard, or click here to go directly to the form to apply. Please keep in mind that Bitverse is currently in beta, and we’ll be working out the bugs and refining the system in the months ahead. You can help us by shooting us a bug report or contacting us to share your feedback and suggestions about how Bitverse can improve. We have a lot of neat ideas still to come and are very excited to roll out new features that will continue to enhance your experience. So jump in, start chatting and have fun!